Playoff Update Week 13 « Roll Out the Quevedo! 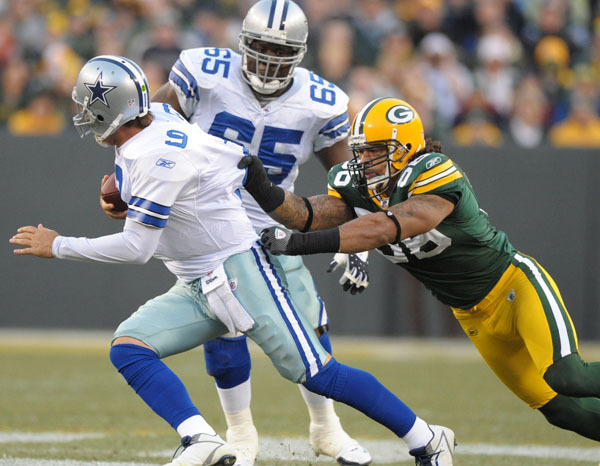 If the season ended today, the Packers would play in Dallas in the Divisional Playoff round. I believe a win Monday night locks up a playoff berth for the Packers. Not officially, but with games @ Chicago, home against Seattle and the last week of the year @ Arizona, a team that will be sitting their key players, I say a win over the Ravens gets them over the hump. The NFC East isn’t done beating each other up, and none of them have looked like world beaters the last few weeks. Atlanta is below average with an injured Matt Ryan and Michael Turner. It’s there for the taking. I think Seattle will take care of SF Sunday, essentially ending their slim chances. That drops it to 4 teams fighting for 2 spots. Them are good odds.